NASA image courtesy Jeff Schmaltz, LANCE MODIS Rapid Response Team, Goddard Space Flight Center. Caption by Adam Voiland. 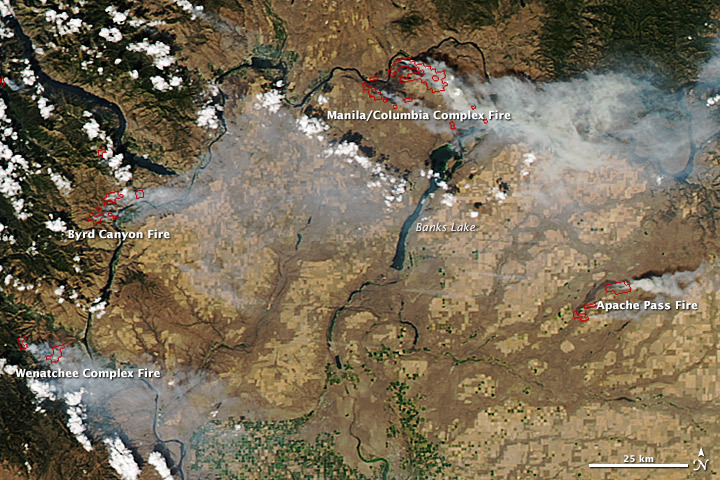 In September 2012, lightning sparked numerous wildfires in central Washington. 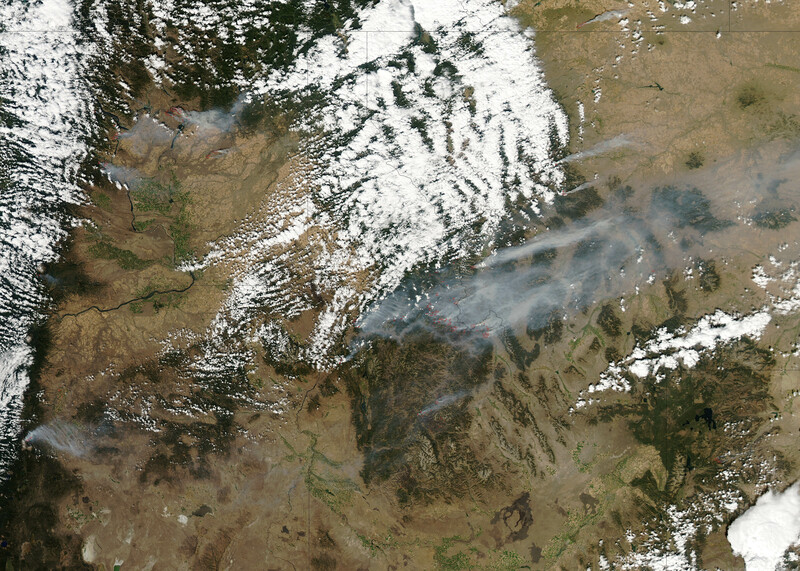 This natural-color satellite image shows smoke from the fires streaming east toward Idaho. The image was acquired by the Moderate Resolution Imaging Spectroradiometer (MODIS) aboard the Aqua satellite on September 10, 2012. Actively burning areas, detected by MODIS’s thermal bands, are outlined in red. By September 11, 2012, more than 8.2 million acres (3.3 million hectares) had burned throughout the United States, in what has proven to be one of the most severe wildfire seasons in the last decade. The only year in the last decade when more acres had burned by September 11 was 2006; at that point in the season that year, nearly 8.7 million acres had burned. Inciweb. (2012, September 11). Washington Incidents. Accessed September 11, 2012. National Interagency Fire Center. (2012, September 11). Year-to-Date Statistics. Accessed September 11, 2012. NBC News. (2012, September 10). More than 100 Wildfires Scorching Central Washington; Hundreds Evacuated in Idaho. Accessed September 11, 2012.